Eating gluten-free* for a good price close to home can be difficult depending on which Barcelona neighborhood you live in. It was very exciting when I found a delicious, high-quality little bistro just a few blocks away that makes unique dishes I can actually eat. 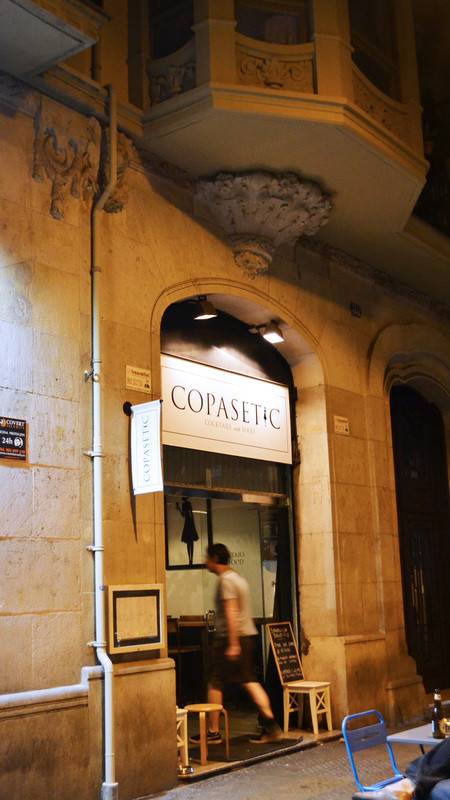 I had read about Copasetic on other websites, and it has always received rave reviews from their clients, so we here at GlutenFreeBCN had to give it a shot and see for ourselves. 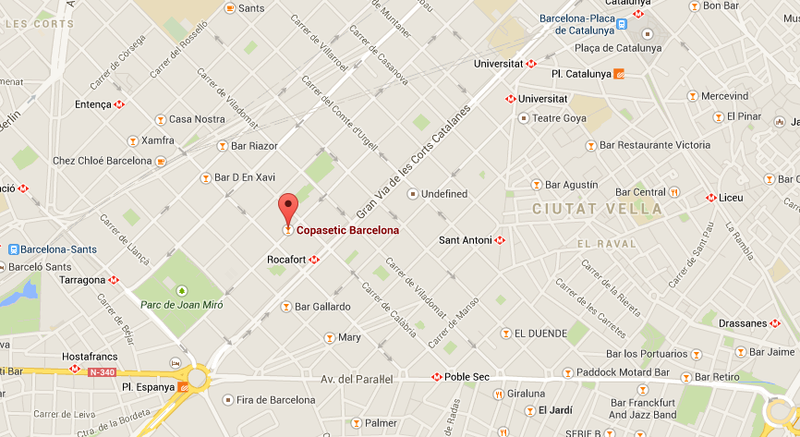 Located on Carrer Diputació, just a few blocks away from Plaza Espanya, Copasetic has a warm and inviting exterior. The small entryway leads you into a place that feels hip, comfortable, and well styled; a modern take on a classic Barcelona bodega. We were greeted right away by a friendly waiter, and escorted to our table. The lighting was perfect, and although the space was narrow, it was intimate and private. At the back, there was a family sized wooden table that looked really comfortable and conducive to familial revelry. I do, however, recommend making a reservation, because the space is limited, and several other couples that arrived after us were denied a table. Its not about the size of the boat, but the motion in the ocean. Even the menu looks cool. The proprietors of this restaurant pride themselves on making flavorful, organic (when possible), honest food at a reasonable price, and I can attest to the truth of that statement. The menu is not enormous, but there are plenty of options, most of which can be made gluten-free at your request. Well known for their tasty breakfasts and brunches, they boast a wide selection of crepes, both sweet and savory, and specialty egg dishes like Benedict and Florentine. They also have salads, sandwiches, and several appetizers to choose from. We went for dinner, and started with the organic roasted red pepper hummus, carrots, and toasted GF bread appetizer (€ 5.50) The hummus serving was enormous, well seasoned, and so delicious that I licked the container clean. We followed that up with some burgers on gluten-free buns. My husband had the organic beef burger with cheddar cheese, caramelized onions, pickles, and oddly tasty, roasted beets (€11.00). The meat was moist and cooked to perfection, and the bun was tasty like a brioche. I chose the free-range chicken breast sandwich with bacon, caramelized onions, sauerkraut, and avocado (€10.00). The chicken breast tasted like it was off of a homemade, oven-roasted bird. Both were served with a baked potato topped with herbed butter and a small arugula salad on the side. They were too big to finish! Copasetic is also well known for their cocktails, and 2/3 of their menu is actually occupied by the adult beverage options. Each drink is carefully made to order, and look really delicious. Sadly, however, due to my recent kidney transplant I was unable to give one a try, but they are definitely on my future to-do list. Well stocked in the spirit department. Overall, the space itself lends to being a great local hangout, coffee shop, or gourmet eatery, and really, it is whatever you would like to make of it. The owners have also created an amazing social program where their customers can “pay it forward” for someone in need. For €.6o or €1.00, you can buy coffee or simple sandwich for somebody who cannot afford to buy one. I will definitely be back to Copasetic very soon to try their coffee, breakfasts, and dessert, and pay it forward for my neighbors who could use a little help. *When I say gluten-free, I am not referring to most Spanish cuisine that is naturally free of gluten. I am talking about meals that are usually prepared with wheat, which are alternatively being catered to the coeliac community. i wouldn’t advice coeliac to go to capasetic since on their official web page they are stating clearly that they do not give any certainty about the absence of cross contamination, and they do not take any responsibility for any inconvenience that can happen to people having coeliac disease or any other food problem. So please be carefull when you post something, people like me who look up to this and other specilized websites/blog may risk consequences if not given good/informed advices. Thanks for your comment A.K. As always, I include links to the website for the places I visit and review, so that people can also research for themselves. People who have severe food intolerances must always look into something for themselves, especially in a place like Spain where the education about food allergies is something new. I usually mention in my post if a place is a 100% dedicated gluten free restaurant, and Copasetic is definitely not, so I did not say that. There are so few dedicated GF places here in Barcelona, that you will almost always need to ask about cross contamination (and hope they know what you mean!). Thank you for looking up that information, as it may be helpful for other readers!